I was supposed to be editing my thesis, not suddenly married to someone I have never met... Someone named Nox - which is as pretentious as it gets, even for the Realm. I had never intended to return to live in the world I left when I wanted to go to Harvard. I didn't understand that Nox would expect to be in charge. As in-totally in charge. Clearly, prognostication is not one of my gifts, because I never could have foreseen how much pleasure this sassy witch would get from yielding to my demanding and hot husband... All of this has got me wondering about a few things: Does everything happen for a reason? Can a girl have everything? Is a husband with magical powers the devil or a girl's best friend? 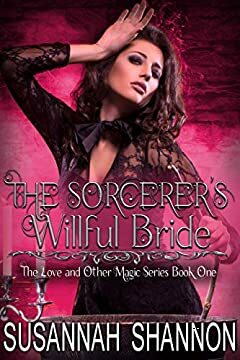 "The Sorcerer's Willful" is a magical romantic comedy with an HEA.